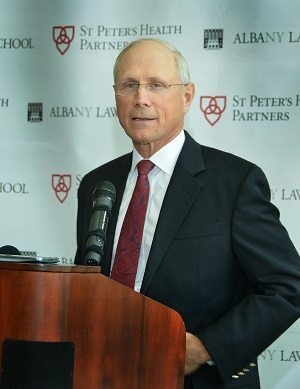 St. Peter’s Health Partners (SPHP) and Albany Law School are partnering to help some of the Capital Region’s most vulnerable health care patients obtain free legal services. The two institutions today signed a memorandum of understanding to launch a Medical-Legal Partnership, which will connect students to represent eligible SPHP patients and their families. Students will be under the supervision of faculty from Albany Law School’s Clinic & Justice Center. Under the partnership, the Clinic & Justice Center will offer legal advice and representation in disputes and other matters relating to a number of issues, from foreclosures, Social Security benefits, and Medicaid or health insurance coverage, to power of attorney, health care proxies, wills, and guardianship. Dr. James K. Reed, M.D. The Medical-Legal Partnership aims to help patients and their families who have legal matters that impair the patient’s health, are created or aggravated by the patient’s illness, or are an obstacle to the patient’s treatment or recovery. In most cases, a hospital social worker will identify an eligible patient, and ask the patient if he or she would like to be referred to the Clinic & Justice Center. If the patient agrees, the social worker will contact the center. Patients and their families may also inquire about obtaining legal services through the Medical-Legal Partnership. After contact is made, the Clinic & Justice Center will confirm the patient’s eligibility for services. If confirmed, the center will contact the patient and enter into a representation agreement. 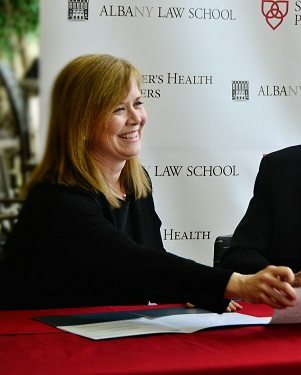 SPHP and Albany Law School are currently seeking certification for their new Medical-Legal Partnership from the New York State Department of Health. For more information about Albany Law School, please visit www.albanylaw.edu. For more information about St. Peter’s Health Care Services, please visit www.SPHP.com.